Simon Starling, one of the most audacious artists in the international scene, has a choice position in this new cultural year at the museum. With a double project which extends from the MAC/VAL in Vitry-sur-Seine to the Parc Saint Léger Art Centre, the 2005 award-winner of the Turner Prize has designed his first two-part monographic exhibition in France. Benefiting from two spaces, he pursues a work focused on transformations, metamorphoses, creating new exchanges, from material to the object and from the substance to the form, or even from one place to another place. Our story with Simon Starling started with his exhibition “Autoxylopyrocycloboros” (2007) (from the catalogue Zones de Productivités Concertées which envisages art in regards to the Economy). We wanted to go further and pursue this association by inviting this well-known artist onto the international scene to take over a room devoted to temporary exhibits for a first large monographic exhibition in France. 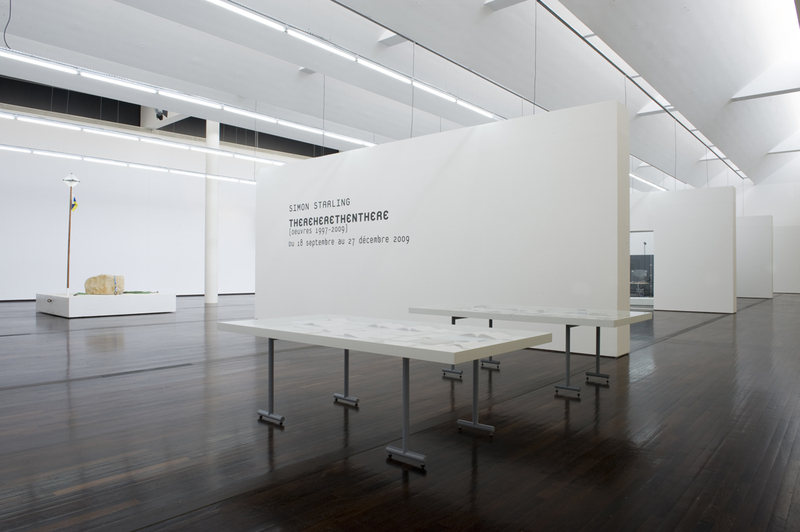 The project “THEREHERETHENTHERE” is a double exhibition, autonomous and nevertheless globally thought out. One of them at the MAC/VAL is subtitled “works 1997-2009” and the other, “the Source” at the Parc Saint Léger Art Centre in takes place in Pougues-les-Eaux. The title is the same for both exhibits, perhaps enigmatic and setting the tone with the French translation: ILYAICI / LÀPUISLÀ. It’s made up of assorted deictics, linguistic indicators of temporality and location whose meanings entirely depends on the speaker and communication situations. Regardless of their size, Simon Starling’s epics provide modified movements. He creates a humoristic factual map full of solemnity, poetry and void of romanticism. One of the major characteristics of this work by Simon Starling is this capacity of involving shapes, more specifically sculpture, but always being grounded by artistic, political, social, economic, historical, and geographical realities. He truly develops poetry in his narration and process. Between gestes – in a behavioural sense – and Geste (epic poem) – in a literary sense, these works are in no way incontrovertible. They undo and remake, destroy and rebuild the world, allowing us to slightly perceive some of reality’s complexity. 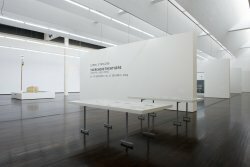 Simon Starling excels in the art of re-interpretation, producing a backcloth for a new social analysis, indicating the ecological, economic and cultural consequences of mobility factors caused by globalisation. This exhibit is jointly initiated by the Mac/Val and the Parc Saint-Léger and the French public is excitedly awaiting its opening! For over fifteen years, Simon Starling reconsiders the history of shapes and questions the notions of value, manufacture and the status of objects. His sculptures, installations and travels focus around acts of transformation and blending in situ. By methodically breaking down matter and context, Simon Starling reorganizes unexpected bonds between fields which are seemingly incompatible, with remote impermanence. For his first two-part monographic exhibition in France, the artist unravels his thoughts on what’s at the heart of current events. At the Val-de-Marne Contemporary Art Museum, this exhibition is laid out like the principle of transformation, playing with the picture and its double. One thing is always leading to another – one of Simon Starling’s driving forces – and this movement becomes the basis of his work. Documentary and fictional evidence is revealed and blends with his encyclopaedic archival work which successfully manages to be neither didactic nor overwhelming. The narrative structure holding the exhibit’s frame together is far from being straight – but answers more to the principle of re-interpreting, allowing for the artist to materialize his progression. The visitors are thus guided through a poetic universe, transcending the visible severity of his work. In this game of successive happenings combined with a mirroring exercise, the Mac/Val visit will surprise you with each work you see, revealing new facets to Simon Starling’s work– the visitor then travels along the path of re-interpretation, trying to find an ever-fleeing meaning. Whether it is in the museum or in the Parc Saint-Léger – which is hosting the second part of his project, the artist displays objects from the past. His contextual art consistently sparks the delivery of a narrative style, the works are closely tied to associated stories. Rock Raft, Flaga or even Three White Desks all have their own individual stories. Starling is able to remodel the pure context of these stories and our experience is suddenly shattered.